I Blog Anime: RD Sennou Chosashitsu: Masterpiece!!! It's been quite a while since last time I commented on this anime. What I though is something that is not going last more than 4 episodes for me turn out to be one of the best of 2008 in my book. This is truly a masterpiece. It took a bit to work into me, mostly I think because I hated the art style. By now, I still can't say that I like its art work, I just learned to accept it. 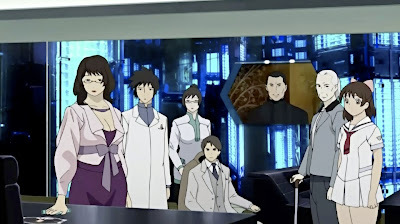 As I mentioned last time, Masamune Shirow (士郎 正宗), the creator of highly acclaimed the Ghost In the Shell and Appleseed series, is responsible for the concepts of this anime. All have been highly philosophical suspense thrillers with scifi as background. RD is a bit less action oriented than his previous work. That might be another reason that it took longer to work into me, because fast paced action like Ghost In the Shell tends to pull me in a lot quicker. There are three more episodes to go. As it stands right now, this is one of the anime series in 2008 would earn a spot on my "MUST WATCH" recommendation list. So, if you haven't started watching it, go get it now! As for award goes, it's not really fair for it to compete in drama category head-to-head against Macross Frontier, they're just a bit too different. I'll have to think up some special category for it, because it IS GOING TO EARN an award from me.